The Chinese name of Sumatra Grinum contains a character of �兰� which means orchid, so many people regard Sumatra Grinum as a kind of orchid according to its literal meaning. As a matter of fact, Sumatra Grinum is not a plant of the orchid family but a vivacious herbal flower. Sumatra Grinum has many other names. It is green all the year round with wide and thick leaves and can grow as tall as 1 meter. The tip of the leave is pointed and the whole leave looks like a sword. The flower stalk grows out in all seasons and is almost as tall as the leaves. Its blossom period is in summer and autumn and generally it has 10 to 24 flowers. The flowers grow on the top of the flower stalk, and each flower has 6 pedals. The flower is mauve in the middle and pink on the two sides. The flower spreads when it is in full blossom or even bends backward. The flower has a strong fragrance, which can spread to very far places; therefore, it is loved by many people. 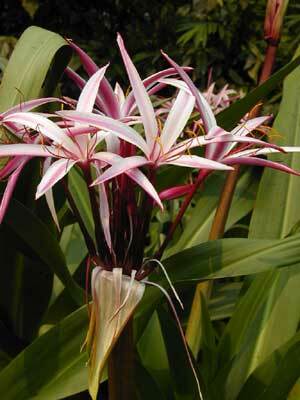 Both the leaves and the flowers of the Sumatra Grinum are very beautiful, thus the plant has high ornamental values. It can be used to decorate the lawns or the living quarters, and make plant fences for houses. If it is planted as miniascape, it can also be placed in meeting rooms, luxuriant hotels or dining halls. It will make these places full of fragrance and pleasing to both the eyes and the minds. The native land of Sumatra Grinum is Indonesia, Sumatra, etc. It is widely planted in tropical and sub-tropical regions in China, particularly in Xishuangbanna of Yunnan. Sumatra grinum is appointed as one of the five trees and six flowers to be planted in temples. Since the local residents in Xishuangbanna all believe in Buddhism and there are temples in almost all villages, Sumatra Grinum is widely planted in this region.